The Classic Reel Bags This is the Classic New England made bag used on Bogdan and other reels. 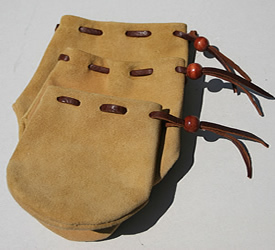 It features an expanded bottom panel and folded over opening - a very sturdy design in heavy suede leather. 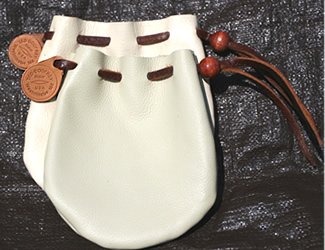 The Classic also features a strong leather thong and closure bead. Three sizes are availabe: small for 2 1/2- 3" reels, Medium for 3.2 - 3.5" reels, and Large for 4" spey size reels. Priced at: $40.00. Godfrey Classic vom Hofe Style Case Vom Hofe was a perfectionist who designed exquisite reels and his special case with hinged top and lustrous suede lining. The Godfrey Case is finely detailed with hand sewn "French" linen thread on Herman Oak Bridal Leather - a high grade "prestige" leather for lasting value. Lining color choices: Burgundy, red, and Dark Forest Green. The Magnetic Closure as seen on the Shearling lined Case is Standard - photos to be upgraded here. We are happy to add your initials to the top or back. The Godfrey Custom Tackle classic insignia is stamped on the bottom. Priced at $325.00 It's Custom Made to fit Your Reel. 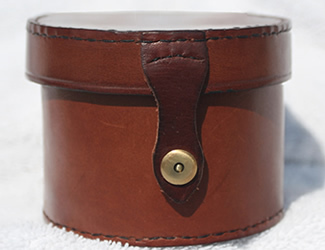 The Godfrey Pancake Leather Reel Cases The nice draw string case that I have been using for years. The little logo tag is a recent addition. Priced at $30.00 each. Available in three size: Small for 2 1/2 - 2 3/4" reels, Medium for 2 3/4" - 3" reels, and Med-Large for 3" - 3 1/4" reels.